That’s Michael Crichton, the physician turned novelist turned director, talking about his physicist friend Murray Gell-Mann, who discovered (and named) the quark. Crichton pretty much invented the techno-thriller genre of books and film, starting with The Andromeda Strain, which is one of the most influential books in my life, for sure. Crichton is probably best known for his Jurassic Park novels, but take a look at his bibliography sometime … it’s astonishing how much influence he has had on modern American culture, period. 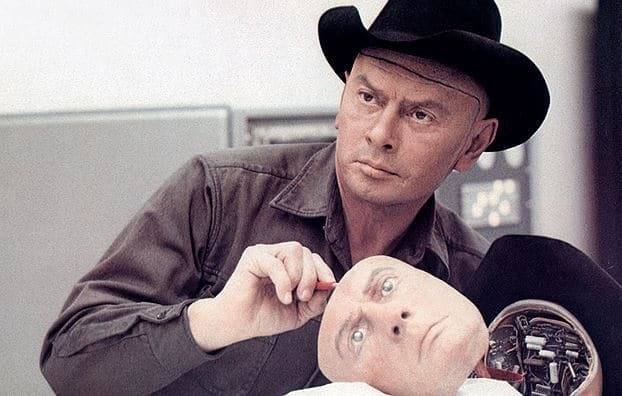 That cover photo on this note, from the 1973 version of Westworld, is one of Crichton’s, too. I’ve written about the Gell-Mann Amnesia effect before, but I wanted to highlight it in a standalone Brief. Why? Because I think it’s the primary driver of the social pathology we have today regarding media in general and social media in particular. And yet, despite having this searing experience with media articles where we actually have meaningful personal knowledge, we believe without hesitation the next story we read where we don’t! We are hard-wired to respond to Missionaries, and when I say hard-wired I truly mean that in a biological sense. It’s what makes Fiat News – the projection of opinion as fact – work. It’s what powers the Trump Train and the Team Elite Club alike. It’s not that facts don’t matter. They do! But the presentation by a Missionary that a statement is a fact is enough to make it a fact within the Common Knowledge Game. That IS the Common Knowledge Game. All it requires is an effective Missionary. Everyone is in on the secret. Everyone is in on the act. Everyone who can is playing the Common Knowledge Game as a Missionary. And everyone who can’t is being played. That includes Michael Crichton, too. One of Crichton’s less remembered novels and films is Disclosure, starring Michael Douglas and Demi Moore in the 1994 film. 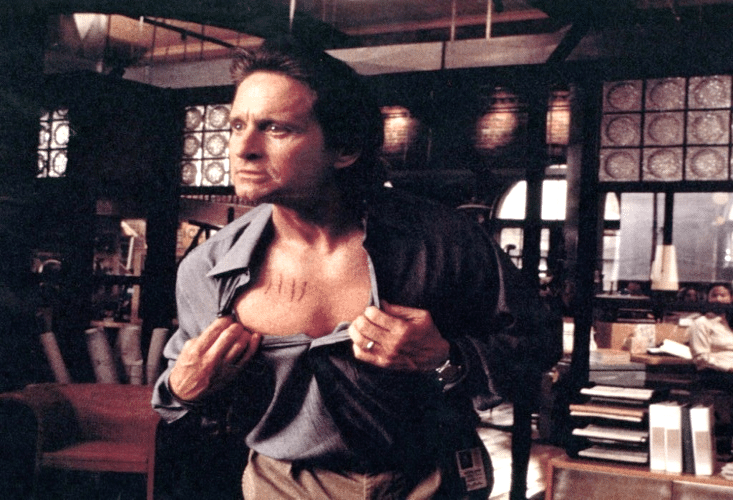 Here’s a still from that movie, taken as the Michael Douglas character realizes he has been set up for a false (?) accusation of sexual harassment. It’s a must-watch movie for anyone trying to figure out what the hell happened to all of us during the Kavanaugh hearings, and it’s a movie that a critical thinker can’t watch today without squirming in discomfort. Why? Because not only is the central plot twist the construction of news and information, but so is the central plot twist of the movie-as-a-thing. Let me put it this way, Michael Crichton was married five times and famously would have had some … errr … difficulties in a post-Harvey Weinstein Hollywood. Disclosure is not just a movie ABOUT the construction of Narrative. Disclosure IS a movie that constructs Narrative, a very particular Narrative that served the interests of the Hollywood studio system and the men, like Weinstein and Crichton, that it made so wealthy and so powerful. This is Narrative creation. This is one of the best examples I’ve got of nested metagames. This is why it’s so important to consume EVERYTHING with a critical eye. Because we are being played, constantly and by everyone. Even in our entertainment. ESPECIALLY in our entertainment. It sneaks up on us without our conscious awareness, because its purpose is to sneak up on us without our conscious awareness. And what’s the dominant entertainment in the world today? It’s not Hollywood any longer. It’s not movies. It’s social media. Clear Eyes, friends. Clear Eyes. When I read stuff in the papers on a topic I know a lot about, and it’s wrong, I have to wonder how much of what they write about stuff I don’t know much about is also wrong. When I worked at Time Inc. many years ago, one of the ways newbies were introduced to the business by old hands was with the caveat that Time was a great magazine until it wrote about something you knew a lot about. Briton Hadden and Henry Luce were arguably the greatest Missionaries of the twentieth century. Understand the need to be skeptical, guess I struggle where skepticism becomes paranoia? I find it exhausting sometimes to go through life trying to calculate all the angles and hidden agendas. No point in being naive though.